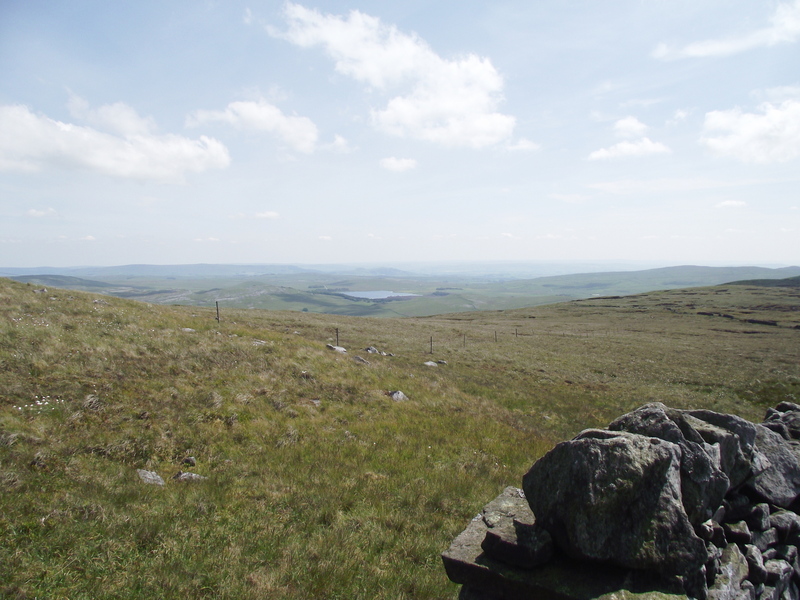 Went up Fountains Fell – didn’t see one fountain! In fact, there aren’t any fountains – The mountain is named after Fountains Abbey near Ripon. The abbey owned quite a bit of land in this area and Fountains Fell and the surrounding area was used for sheep grazing. 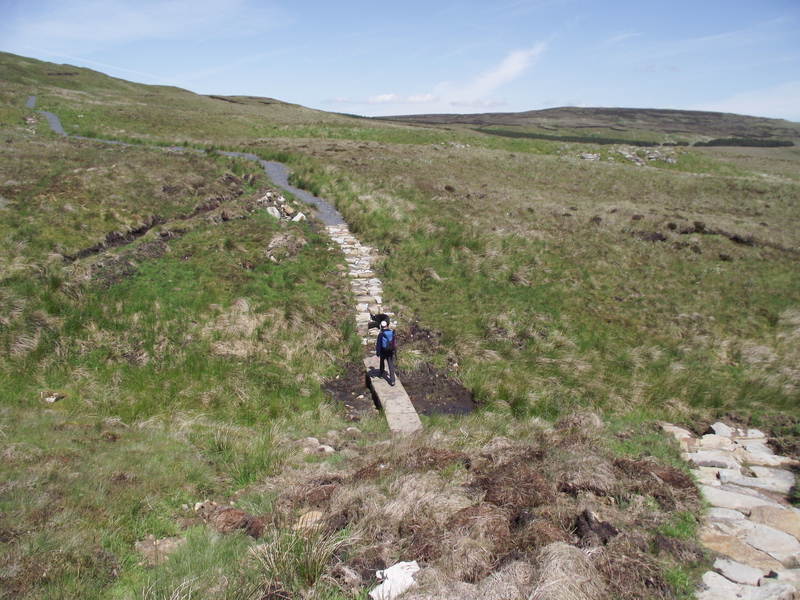 The monks also had a fishery at Malham Tarn, and used the “Monks Road” from Arncliffe to Malham Tarn as part of their route from the fishery to the abbey – very handy if the Abbot fancied a trout for his tea! 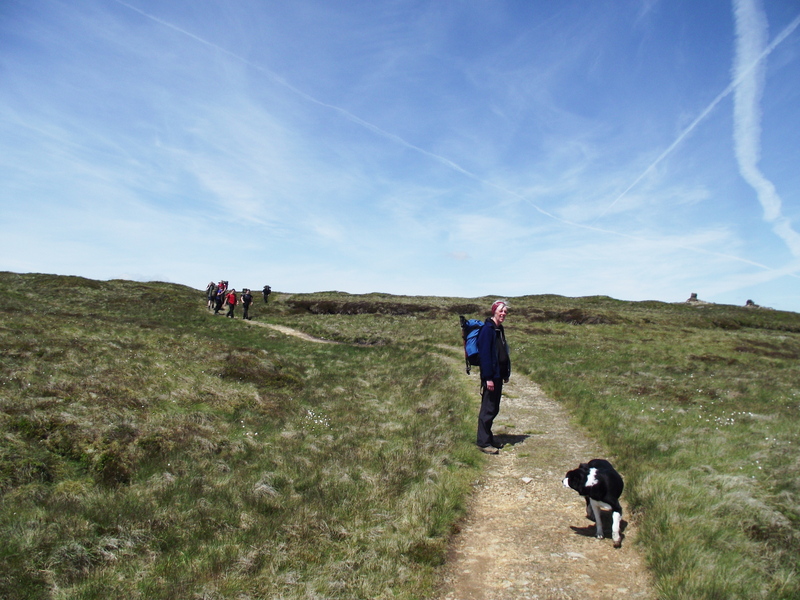 Most of the people walking around here nowadays are following the Pennine Way rather than the Monks Road. The PW crosses Fountains Fell almost (but not quite) at the summit, and most of the ascent is steady and gradual. 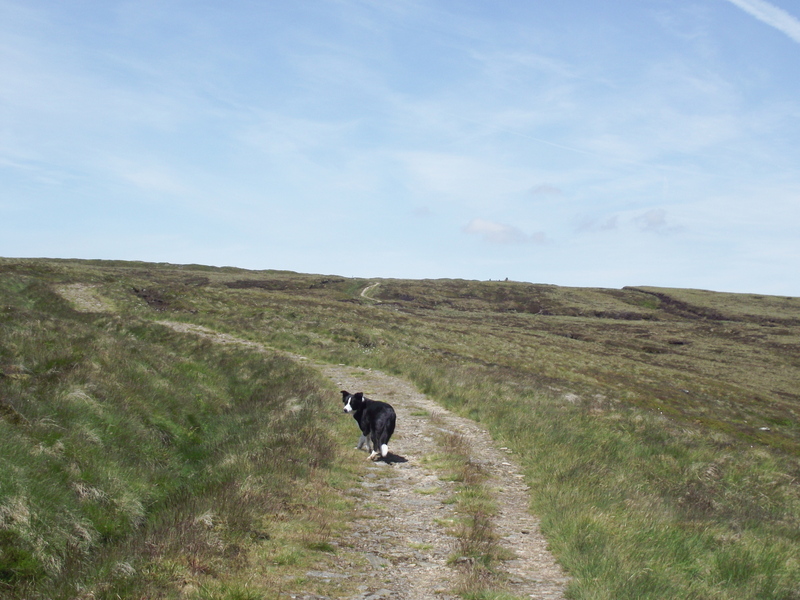 The route has taken some hammer over the years though, and in several places the path has been repaired and improved. It was a bit like rush hour on our walk up, as we were passed by two groups of teenagers well loaded down with big rucksacks. 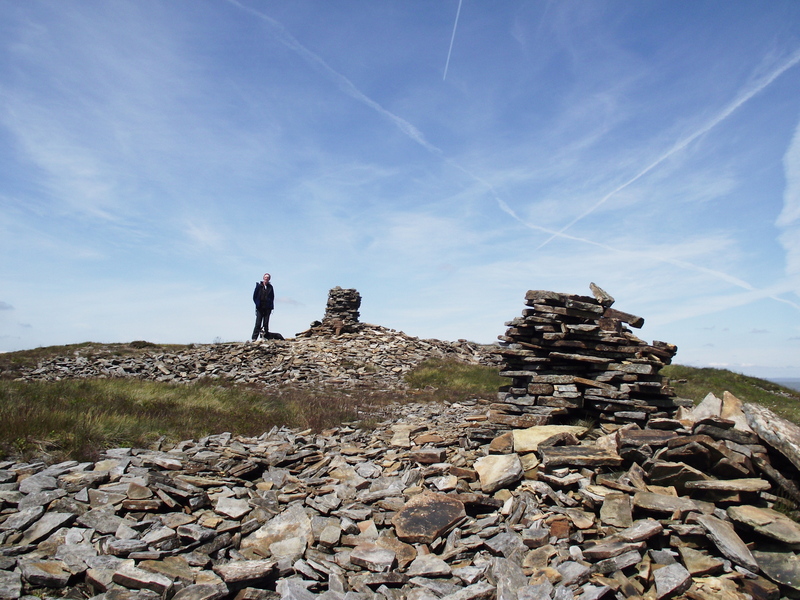 The twin cairns next to the Pennine Way are the nearest that walkers on that route get to the summit, which is around 10 metres higher. Today, though, we were on a mission. 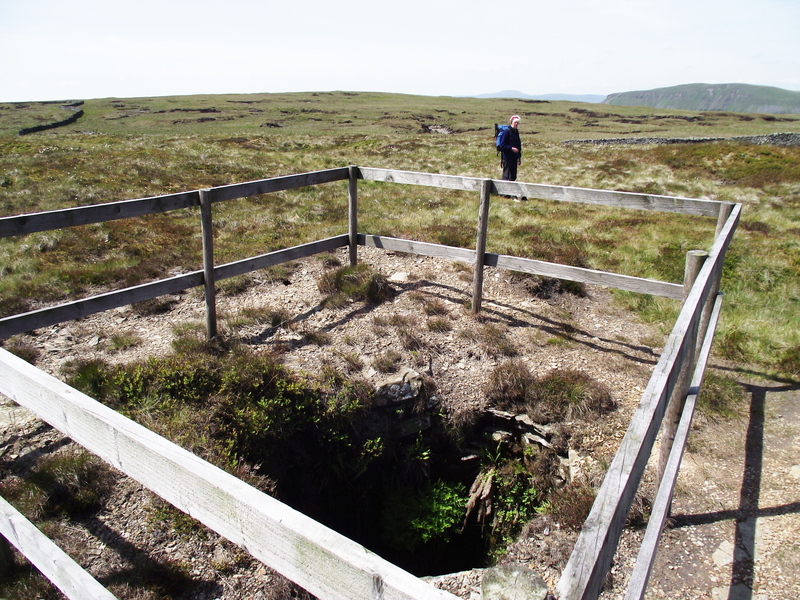 First of all we had a wander round the old mine shafts on the summit plateau. The miners were after coal, used to smelt lead also mined in the local area – not far from the shafts we found what looked like a stone shed, but was in fact an oven for ‘coking’ coal. Not far beyond there is the aptly named ‘Pile of Stones’ very near to the real summit at 668 metres. From the summit a track by a stone wall descends southwest, heading towards the main potholing area on Fountains Fell near Fornah Gill, with Gingling Hole and Magnetometer Pot being perhaps the best known. Not for us, though. 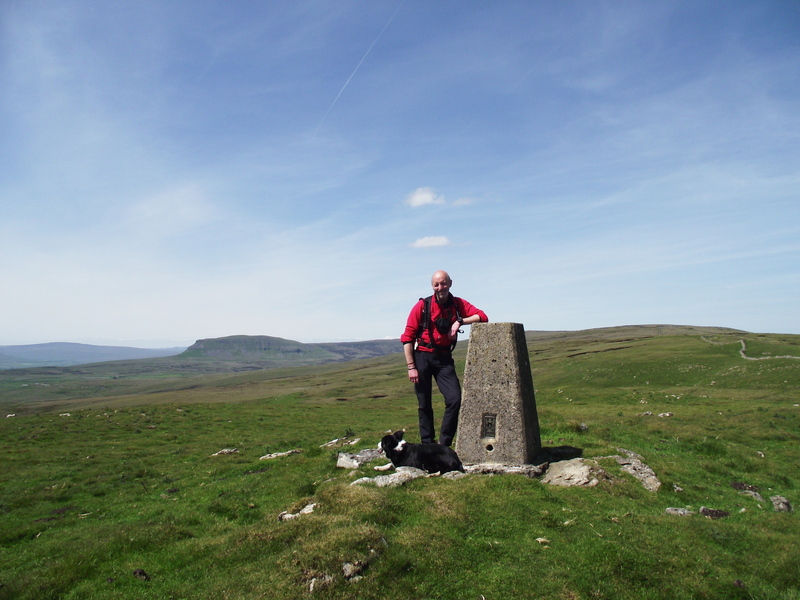 Instead, we were heading southeast, first of all along the plateau then eventually descending to the Trig Point above Knowe Fell, giving views across to Malham Tarn in the distance. 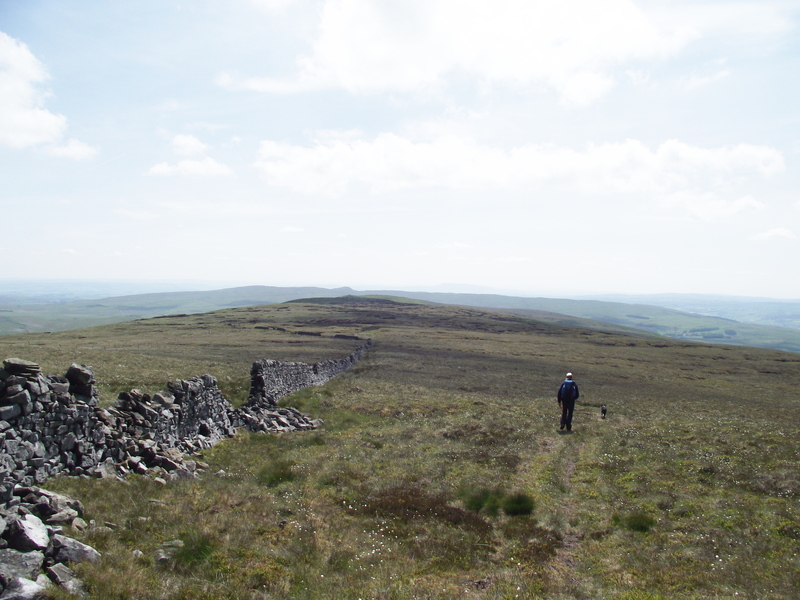 However, the best of the views were behind us as we walked this section, namely the view back to Pen y Ghent. 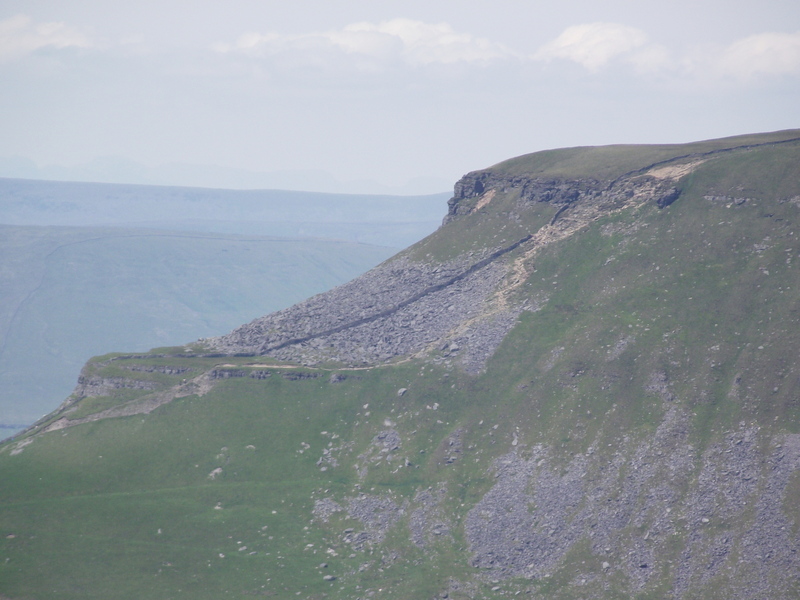 I’m more used to seeing Pen y Ghent from Horton in Ribblesdale, and the less than familiar view towards the east side of the mountain provided constant interest – the eroded path up through the crags of the South Ridge was clearly visible, even without using zoom on the camera. The gradual descent down the fell was over fairly featureless ground, but a stone wall followed by a wire fence provided a good navigational handrail. 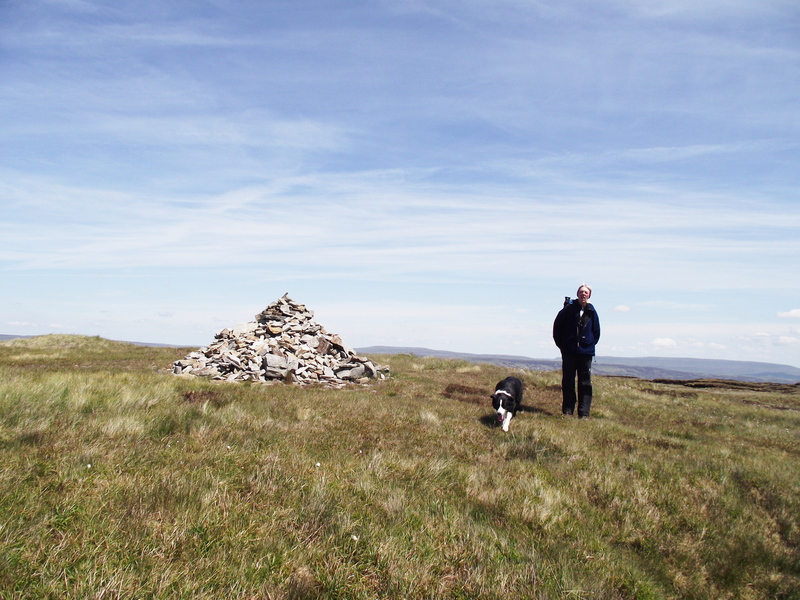 Before long we were at the Trig Point, and we stopped briefly for a photo before heading over to the wire fence to descend Knowe Fell. Here the afternoon was livened up somewhat when I found that the fence was electrified! A crossing point nearby saw us over without further incident, though we thought it wiser to pick the dog up and pass her over. From the fence it was all downhill back to the car. 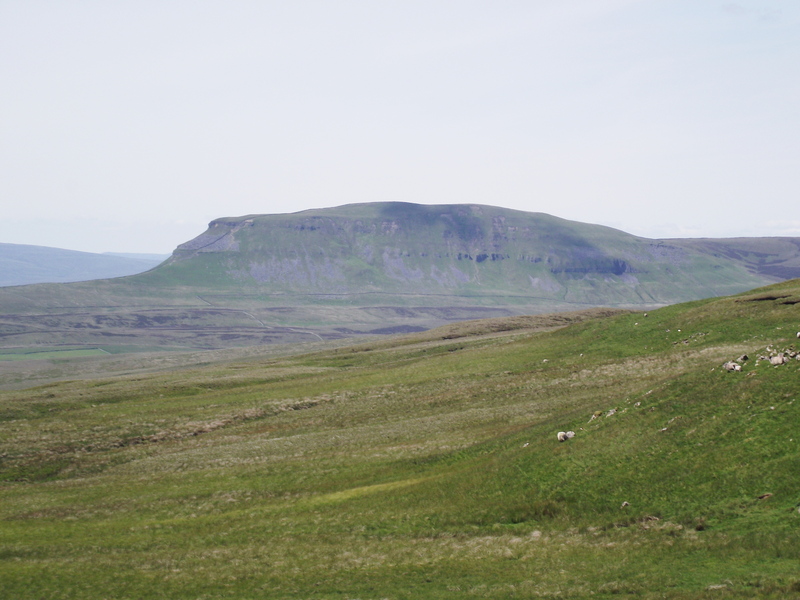 The last time we were here we hadn’t seen much at all, but today the views stretched northeast to the hills of Swaledale and southwest as far as Pendle and beyond, but the stars of the show were, as usual, the ‘Yorkshire Three Peaks’ – Ingleborough, Pen y Ghent and Whernside. This entry was posted in 3. 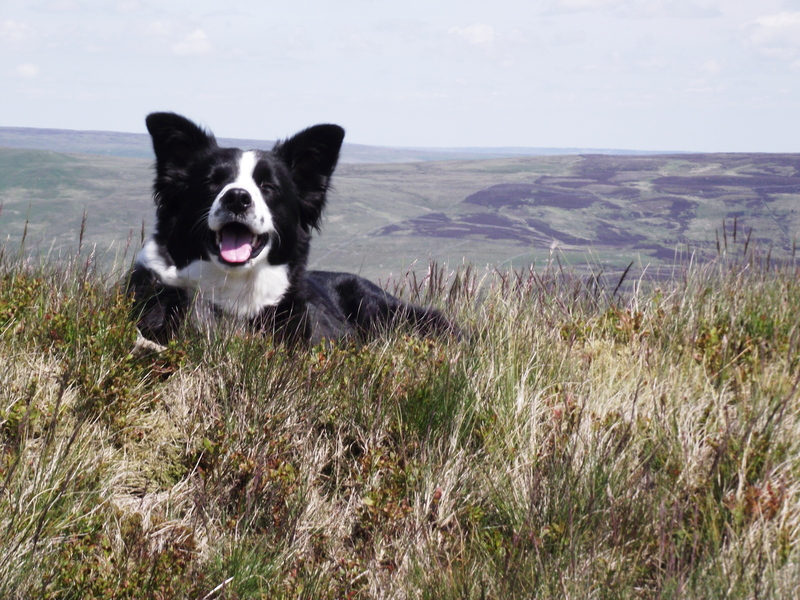 Yorkshire Dales and tagged Border Collie, caving, Fountains Fell, hillwalking, Malham, mountains, Pen y Ghent, Pennine Way, Three Peaks Challenge. Bookmark the permalink.